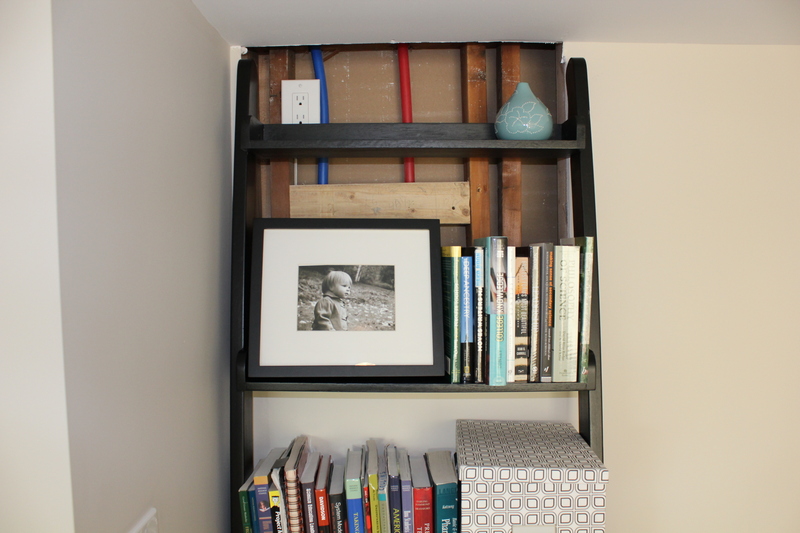 Right before I went on maternity leave we remodeled our basement and bathrooms. Near the end we ran out of money, and were unable to finish some things. At the time we had no idea that I would not return to work, so we thought we’d just pick it back up and complete everything once I started getting paid again. Whoops. Now it seems we may never have the cash flow to fully finish what we started, so our house just looks like the contractor forgot to return one day. 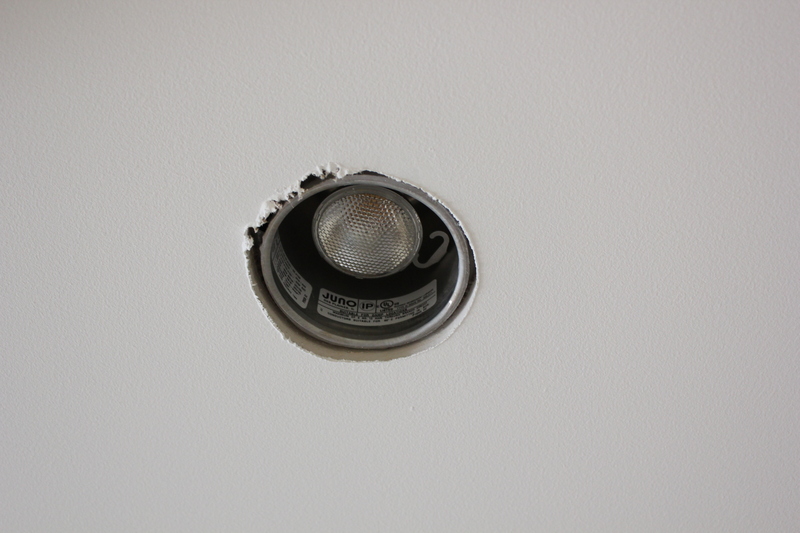 For instance – we haven’t yet purchased trim for our recessed can lights. Wouldn’t be so bad if there were only 5 or 10. BUT WE HAVE 38. The best part is that occasionally drywall dust will leak out of them when someone walks upstairs, leaving a nice little clump of crud on the couch, carpet… When I put the baby on the floor downstairs I strategically place her between lights so nothing falls in her eyes. Such a good mommy. 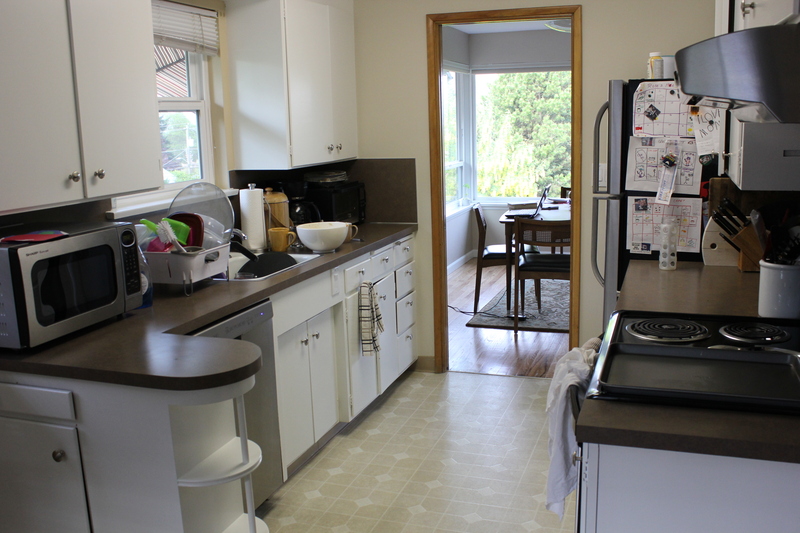 We also plumbed for a kitchenette in the basement, but ran out of money before we could install cabinets. 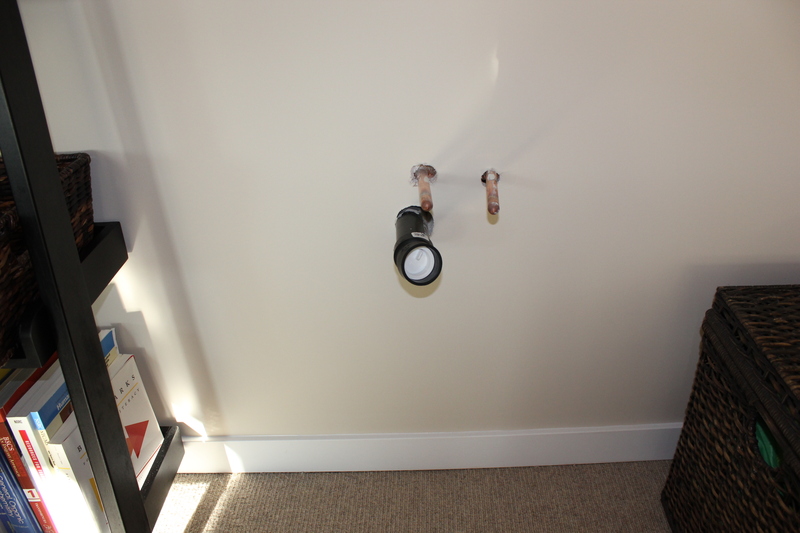 So we have these very child-friendly pipes sticking out of the wall. I’m trying to think of a creative way to hide them before the baby starts crawling. Covering them with tennis balls was my mother’s suggestion. Surely I can think of something a tad classier than that? There’s also an awesome hole in the wall where a microwave was supposed to go. This is my weak attempt to cover it with a bookshelf. But I’m going to have to start collecting knick-knacks to fill in the gaps. Maybe I can find my Precious Moments collectibles from the 8th grade. However the most ironic part is that we opted to remodel the bathrooms instead of the kitchen. But now that I quit my job, I spend maybe 6 minutes/week showering and grooming myself, yet I spend about 16 EFF-ING HOURS A DAY in the kitchen. I hate the kitchen!! 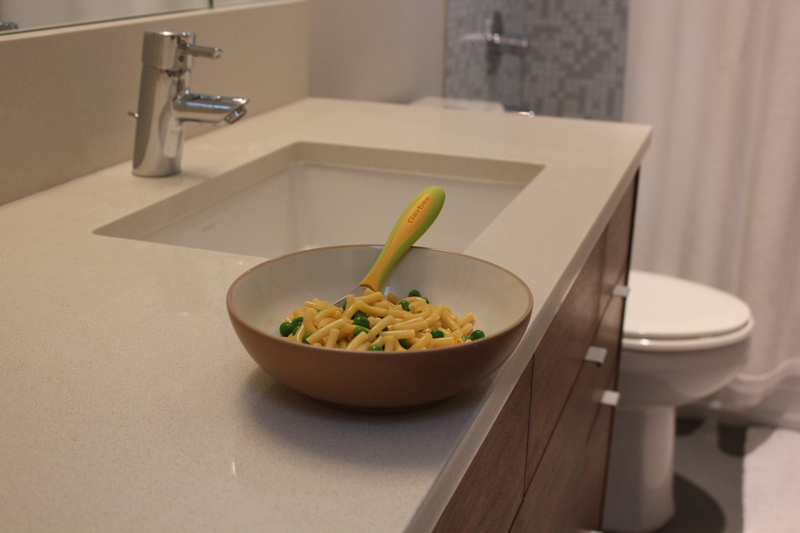 It’s got a bad layout, little cupboard space, even less counter space, ugly linoleum floors, horrible flourescent lighting…and countertops the color of poop. That brown backdrop is killing my otherwise beautiful cooking creations. 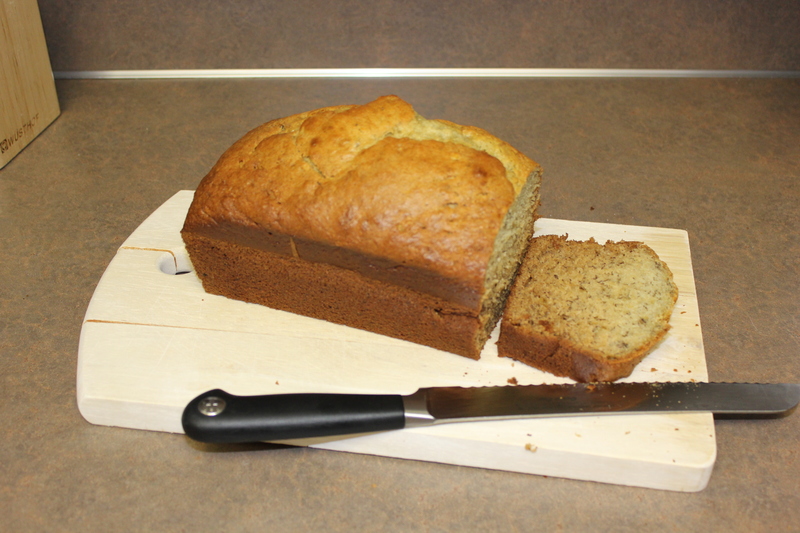 Even my masterpiece – that amazing banana bread, have I mentioned it? – looks sad against the poo counters. Brown is just not appetizing. So, I am going to start taking photos of my cooking creations in the bathrooms. Then I’ll at least feel like I’m getting more out of that investment. Last week I made my daughter mac-n-cheese (box brand, not homemade). See how much more lovely it looks against the bathroom? I mean, what says ‘delicious’ more than seeing a toilet by your food? girl i like your kitchen. you so don’t want to see mine. we’re in an apartment, so i can’t remodel, but boy i’d rather your kitchen over mine any day.